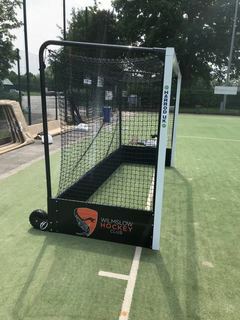 We have now taken delivery of two sets of brand new goals, which are branded with the club logo. These will become our new match goals with the current red set being used now for practice only. All the old wooden goals have now been removed from the perimeter of the astro so improving the overall appearance of the club. This investment is part of the ongoing development plans for the club and will be a fantastic addition to our facilities. Contact us here if you are interested in finding out more about our club either as a player, official, coach or volunteer. © 2013 - 2019 Wilmslow Hockey Club. All rights reserved. If you wish to withdraw consent from us holding your personal data please email wilmslowhc_secretary@zoho.com requesting your data be removed from the site. However, this will only be possible if you cease your membership.